It’s a callback to Deltron 3030’s self-titled 2000 debut, where it was Damon Albarn recording his own, Shatner-esque captain’s log to introduce one of the most unexpectedly influential hip-hop albums ever. Del the Funky Homosapien was and is a beloved underground MC and he recruited the gifted producer Dan the Automator to help him flesh out his idea for a concept record set in the year 3030. Montreal DJ, Kid Koala (Eric San) was brought into the fold and, by evoking the future, the trio made history; the album remains a crucial touchstone for catchy, experimental hip-hop. While the début featured Sean Lennon, Money Mark, Crash Test Dummies’ Brad Roberts,and Albarn (and even begat the Blur frontman’s supergroup Gorillaz; their fluke hit single “Clint Eastwood” features Del and the Automator), 2013’s "Event 2" is even more star-studded. Albarn returns and this time he’s joined by actors David Cross and Amber Tamblyn, chef David Chang, Rage Against the Machine’s Zack De La Rocha, the Lonely Island's, Mike Patton, and more. But the biggest coup is the inclusion of Gordon-Levitt, who got involved after working with Kid Koala on a movie about time travel and, ironically, the future. “That’s how I actually met Joe, through Rian Johnson’s film "Looper",” San recalls. “Rian asked me to be the DJ in the future in that movie so I made this future retro-blues for that one scene. I flew down to New Orleans and that’s where I met Joe. The tone in question is often rather bleak. Despite the upbeat production, Del’s lyrics describe a society in decline, torn up by shoddy politicians, economic disparity, and interminable war. So, as the Automator suggests, not too different from where we’re at right now. 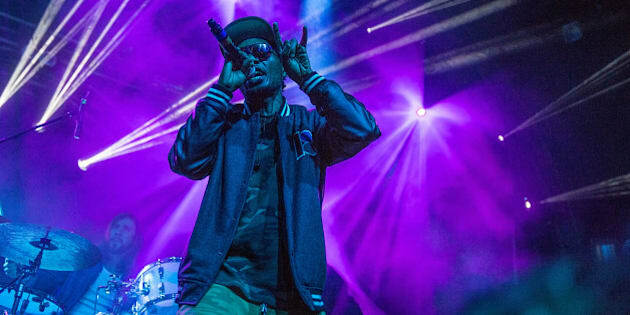 Though fans have clamoured for a new Deltron 3030 album for 13 years, Del himself says he’s not sure a follow-up to "Event 2" will ever see the light of day. “Actually, this album wasn’t that fun to make,” he says over the phone, while riding his skateboard. “That’s something in the future, I’d think about. This is probably gonna be the last Deltron record I’m gonna make and the reason why I’m saying that is because the expectations would be so high, there’s no way to meet their demands. And even if I did, it still wouldn’t probably be good enough for people. People always want something bigger and better. I’ve already done it to the point where it was damn near impossible for me to even do this one. It took a lot of work for me to stuff it into this format. This is more to write a book with or make a movie or a comic book or something that allows you to have more space and time." You can listen to this entire interview on the Kreative Kontrol with Vish Khanna podcast.